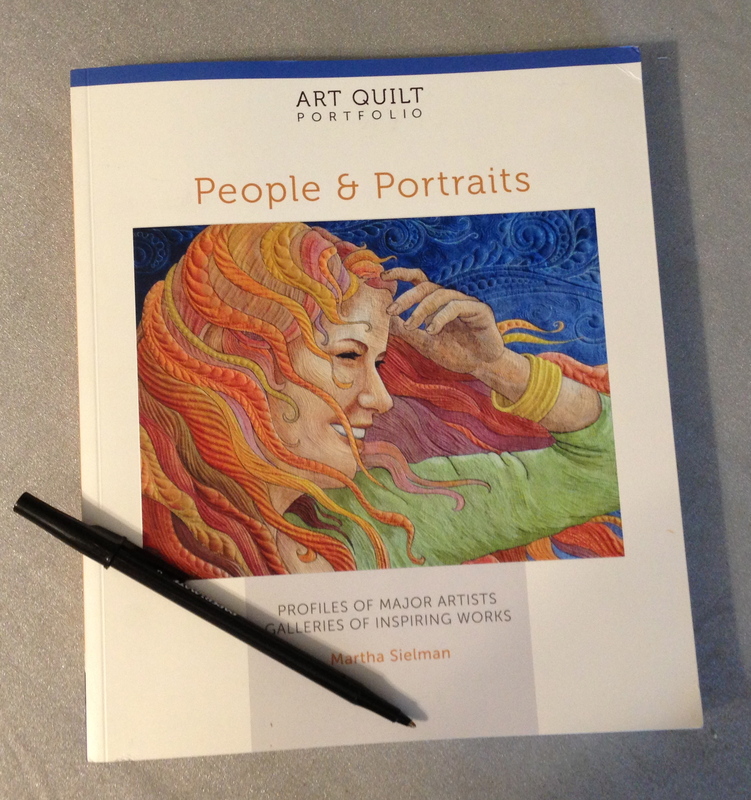 Today is My Day on the month long Blog Tour of Martha Sielman’s latest art quilt book called Art Quilt Portfolio: People and Portraits, published by Lark Books. Her books** are a “MUST HAVE” in your art library. Lark Books is giving away a copy of the book as part of this blog tour. Please respond with a comment to my blog by June 28th (one week from today) with your email address (so I can contact you to get your mailing address). I will pick names out of a hat and one lucky person will receive their own copy. 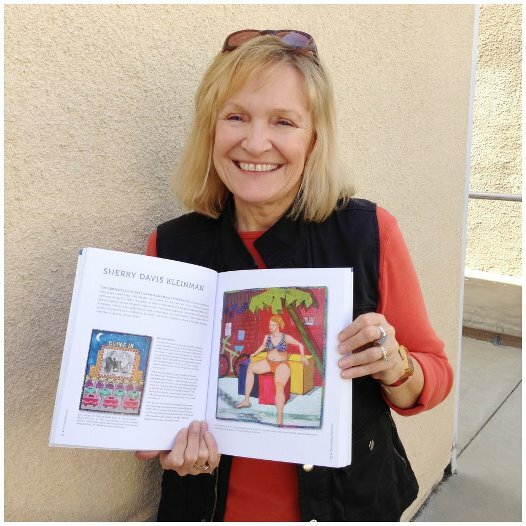 I am honored to be one of the 21 featured artists Martha has chosen for her book. What I have loved about each of Martha Sielman’s art quilt books is that the reader gets to really know each featured artist with an in-depth interview with accompanying photos of each artist’s work. In addition there are many photos of individual works of art from the “Who’s Who” of portrait art quilters (over 100) from around the world today. It is a treasure trove of inspirations for artists and non-artists alike! It is a book you will come back to again and again. Portraits of people have always fascinated me. As a child I would copy photos of famous people I saw in magazines in pencil. As an adult I have “graduated” to life drawing classes, preferring to interpret the figure from an artist model with a wide variety of media, from paper to fabric. I am intrigued by the face and the figure, the expressions and shapes. I love to watch people, guessing their stories of who they are or what they are doing. I strive to pull my viewer into my images of every day moments, so that they can relate to what I have created. Each person will bring their own story to what they see in my work. I create a scene for the figure to live in and to tell a story. I am excited that two of my pieces (not in the book) will travel this fall as part of the Studio Art Quilt Associates’ (SAQA’s) People and Portraits Exhibit. 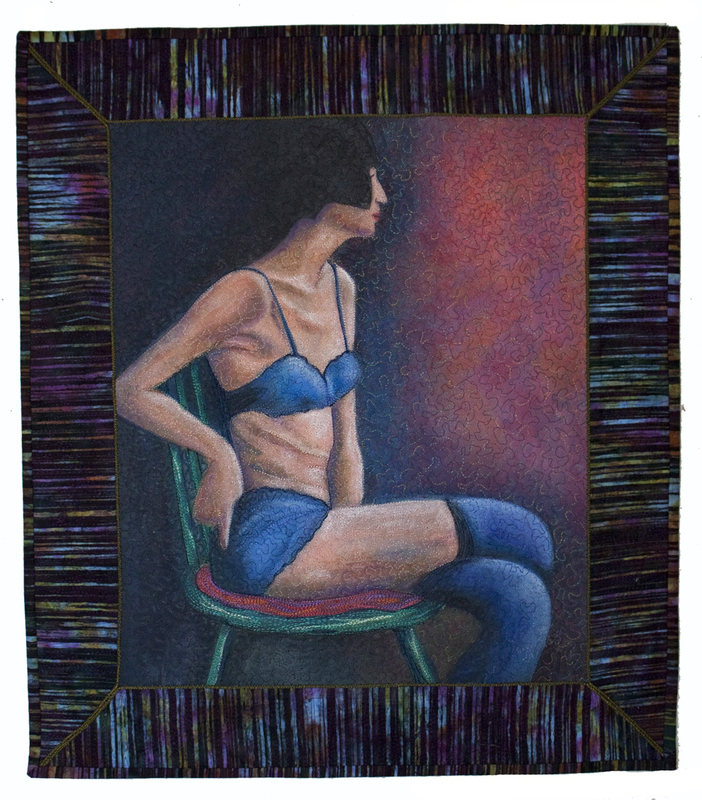 Girl in Blue Stockings is one of the two from the exhibit that will debut at the International Quilt Festival in Houston in October, and continue traveling to other venues. In this detail image, you can see some of the many layers of stitching I used to create textures and layers that are integral to the finished piece. 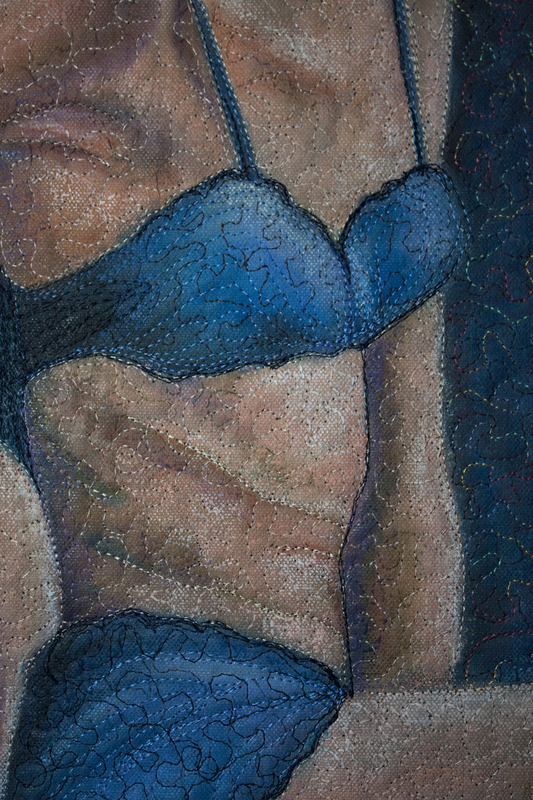 I painted the woman’s image on raw painter’s canvas (no gesso) that had an initial layer of meandering machine stitching that I then painted over. I continued to add more layers of stitching and more layers of color (water-soluble artist crayons) until I had built up the amount of color I desired. Please leave a comment to have a chance at owning a copy of this inspirational book…and I encourage those of you who do not win, to order your own copy. Each page is “eye candy” that you will go back to time and time again! Below is list of others on the blog tour. Check them out too! What a gift you have, Sherry! I’ve never seen such beautiful and original work! I could look at it all day! Great work! I’m still working from the creative energy boost from the SAQA conference in Santa Fe. Don’t know if I’ll make it to Long Beach, but I’m planning to go to the conference in DC next year–how about you? Thanks Linda…I will be at Long Beach (did you hear it is the last year? )…I don’t know about DC…loved seeing you in Santa Fe. Thanks Shelley…we have been missing you on Fridays too…I am taking a summer break…hope to see you in the fall. Congratulations–on having two pieces selected for the traveling exhibit. The shading you’ve done to create the body contours on Girl in Blue Stocking is very effective. Thanks for your comments…I appreciate them. 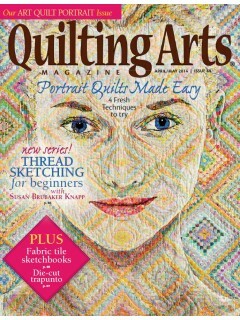 How exciting for you Sherry to have two of your pieces highlighted in what seems like an amazing book. I look forward to looking at the book. 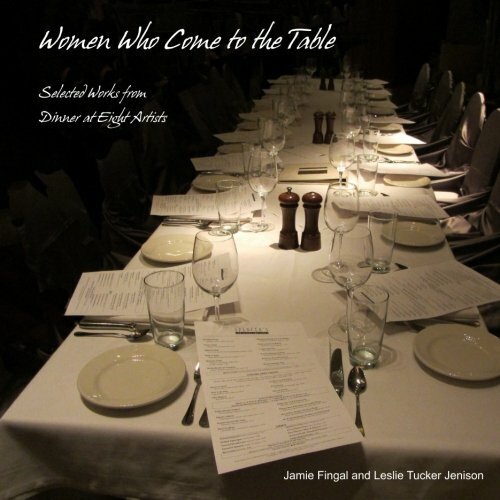 Thanks, it is a wonderful book…so many inspiring artists to see…so honored to be one of them. I like the humor and pathos in your subject choices. Thanks Rachel, I appreciate your comments!